There is simply nothing in this world or the next that tastes like food kissed by fire and bathed in smoke. Our attraction to the scent of cooking on fire is basic; the wafting smoke awakens some sort of primordial urge buried deep in the recesses of our brains. A mere whiff of that tantalizing smolder can trigger salivation and the sounds of grumbling bellies. There are two normal routes for outdoor cooking in the South: barbecuing and grilling out. Barbecue, as both a noun and a verb, hovers between religion and sport in the South, none of which are taken lightly. Whether you go old school and dig a pit or fire up a brand-new komodo, cooking barbecue is a long, slow process, the alchemy of transforming a simple hunk of meat into a moist, tender delicacy. Grilling out is something else entirely. Grilling out is quick and easy. Grilling out means burger and brats, and chops or chicken. Whatever the meat, grilling out is as all-American as baseball and apple pie. Sadly, sometimes the results of those tantalizing smoky scents don’t meet expectations. Sometimes the results are shrunken, charred burgers with more bun than beef or chicken that is as dry as a Sunday dinner on the grounds at a Baptist church. And grilling out can be complicated. Sometimes, the meats are on the grill, but the potato salad and condiments — along with everything else — is indoors. What’s supposed to be a simple cookout turns the entry to the back deck into a revolving door. Instead of worrying about burger cookery, mix things up with gumbo. Yes, gumbo. But this recipe won't leave you standing over a simmering pot for hours. Leave the soup pot in the cupboard and pull out the grill. 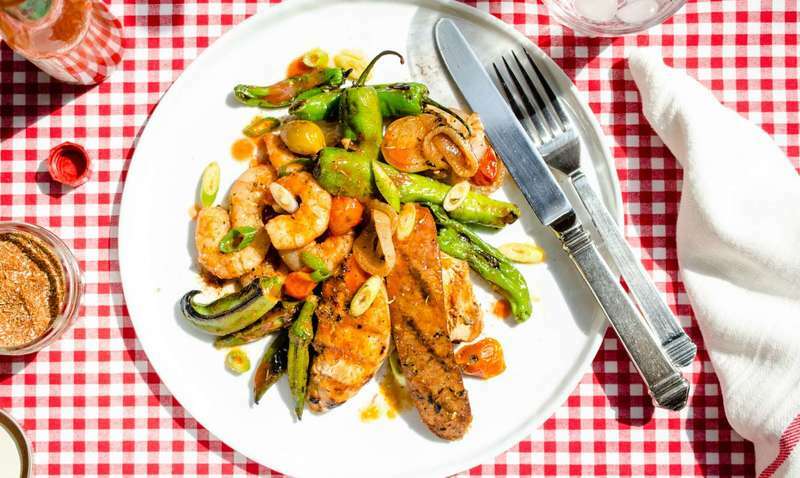 In my recipe for grilled chicken and shrimp gumbo, succulent shrimp, juicy chicken, and spicy andouille sausage team up with sweet onions, peppers, tomatoes, and okra for a delicious dish that tastes like gumbo but doesn’t take hours to cook. It’s easy, quick and delicious. I guarantee this dish is going to knock your socks off. Complete your gumbo grill-out with thematic take-away gifts for guests. 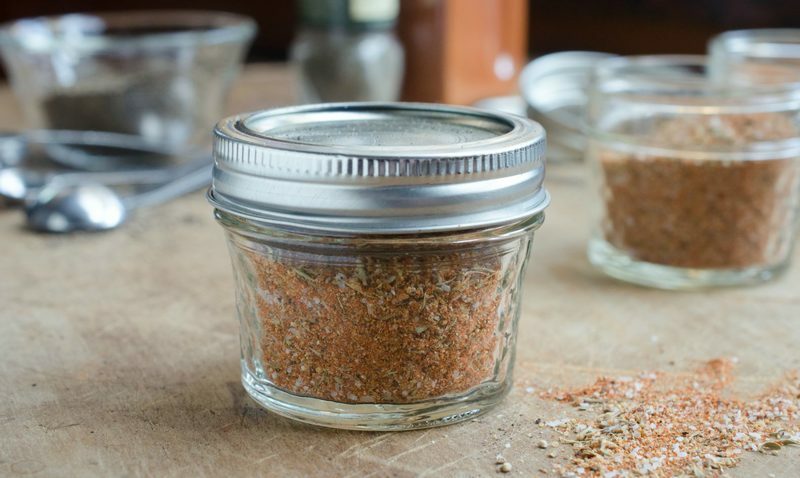 An easy option is a quick-to-make jar of Creole seasoning. Many of the store-bought Creole seasonings are mostly salt, sometimes with added chemical preservatives and anti-caking agents. My simple blend is a mixture of salt, pepper, and dried herbs and spices. How’s this for anti-caking: shake the jar! Prepare a charcoal fire using about 6 pounds of charcoal and burn until the coals are completely covered with a thin coating of light gray ash, 20 to 30 minutes. Spread the coals evenly over the grill bottom, position the grill rack above the coals, and heat until medium-hot (when you can hold your hand 5 inches above the grill surface for no longer than 3 or 4 seconds). Or, for a gas grill, turn on all burners to high, close the lid, and heat until very hot, 10 to 15 minutes. In a large bowl, combine the chicken, shrimp, sausage, tomatoes, okra, onion and shisito peppers. Add the oil and Creole seasoning, and toss to evenly coat the ingredients. Thread the shrimp, tomatoes and okra onto separate skewers. (The chicken, onions, and shisito peppers will go directly on the grill. If using pepper strips, thread onto skewers.) You could skewer and then season, but coating ahead of time ensures an even coating of spices — and messy fingers, but you can always wash your hands! Now, it’s a matter of cooking in batches, working the grill, and trying to make sure everything is ready about the same time. However, don’t overthink this — set a second bowl beside the grill and as the items are ready, simply toss them into the bowl and cover to keep warm. Place the chicken pieces on the grill and cook until firm, turning once until the juices run clear when pierced with a knife and the center registers 165 degrees, about 4 minutes per side. Meanwhile, place the onions and peppers on the grill and cook until tender and charred, about 7 minutes. Add the okra and tomatoes to the grill and cook until charred and tender, about 5 minutes. Arrange the sausage over slightly cooler heat and cook until charred and warmed through. Towards the end of cooking when everything is nearly done, add the shrimp and cook, turning once or twice, until the shrimp is opaque, about 2 minutes per side. Transfer the cooked ingredients to the second large bowl, removing from the skewers as needed. Top with the warm ketchup and scallions and toss to coat. Cover the mixture tightly with plastic wrap and let the vegetables steam and wilt slightly, about 3 minutes. Remove the plastic wrap. Taste and adjust the seasoning with salt, pepper and Creole seasoning to your liking. Serve immediately with additional hot sauce on the side. Combine all of the ingredients in a small airtight container or mason jar. Stir to combine. Store in a cool, dry place for up to 3 months.